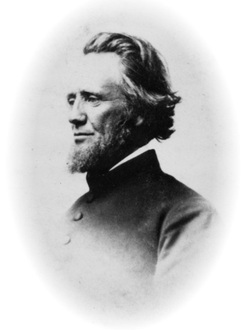 F. W. Gunn from the 1860's. The relationship between Charley Goodyear and F. W. Gunn, is an odd one, but also one which exemplifies the characters of both men. When he left the farm in an abrupt manner, he lost access to the Logan’s membership to the Library Association and “was thus deprived of the books.” This was a problem for the young Charles, and he worked to resolve it. He bought from Woolsey Leavitt a life time membership to the Library Association for $2.50, a $0.50 discount from what a membership would normally cost. After earning enough money to buy the membership, Charley began participating in the auctions, bidding with money that he earned from other jobs. It was through this direct contact with the Library Association that Mr. Gunn took notice of the curious little boy with a “passion for reading.” Eventually, Mr. Gunn took that curious boy under his wing, and in the winter of 1855-56, Charley Goodyear commenced going to Mr. Gunn’s school, The Gunnery. Charley, while a student, was also much more than that. He participated in what might be called in modern times, a work-study program. In the winter months he would perform simple chores, while also obtaining an education from Mr. Gunn with the other boys. In the summers, he would work for Mr. Gunn, earning wages. Even though he did not receive a formal education from Gunn in the summer, he was encouraged by Gunn to continue his studies and, of course, read. During this short period in the life of Charley, he became much more than just a pupil, but rather, a family member. He lived with Gunn for about six years until the fall of 1860. This was the fall before the day that he would join the army in defense of his nation. During his stay with Mr. Gunn, he became extremely close to the Gunns, and they in turn took him on as a child. They even helped his poor mother and sister, without Charley knowing about it. That kind of closeness between a student and his teacher not only indicates something of the character of Mr. Gunn, but of the determination that Charley had, and his love to learn. Mr. Gunn, and his wife were part of the reason that Charley enlisted with the Union Army. Mr. Gunn, being an abolitionist, strongly influenced Charley, to the point that he also became an abolitionist. Though he never comes out and mentions his abolitionist beliefs, it is apparent in his actions (such as joining a Colored Regiment so early in the history of the U.S.C.I.) When the war broke out, Charley signed up, in part-because of those beliefs. In a later letter, it is mentioned that Charles believed everyone should join. (September 19, 1862) In this time few saw the war as a war based on the idea of abolishing slavery, but rather a war based on the idea of the preservation of the union; Charley saw it for what it truly was. This was likely a major part of his reason for eventually becoming an officer in a black regiment, what would become the 9th U.S.C.I. He also continued his education while in the army. While stationed at Fort Scott, Charley asks for Gunn to send him an algebra book, partly because he was bored otherwise. His was a mind always looking to further his knowledge and status. When he left for the war, Charley did not lose contact with Mr. Gunn, or his entire family. The letters that were saved are written to Mr. Gunn, Abigail Gunn, and even Dan Gunn, Mr. Gunn’s 15 year old son, and they show his connection to the family. He kept in touch, and cared much for their health and well-being. They traded pictures of each other, and on more than one occasion, Charley shows a great understanding of the intimate details of their lives. Almost every letter from Mr. Goodyear was finished with “Give my love to all,” another indication of their closeness. Even the frank tone of the letters shows how close they were. Instead of formalities, Charley writes in a frank and sincere style, writing about what was on his mind, and what he truly believed. He was an adopted member of the Gunn family, and possibly one of Mr. Gunn’s closest students. They continued to trade letters through the early to mid-1870s. Unfortunately, almost all of the correspondence has been lost in time, and fire. Many of Gunn’s letters were lost in a fire in 19__, and Charley lost almost all of his letters when his house burned down in 1872. The only remaining letters, as far as we know, are on this website and lodged in The Gunnery archives and the Gunn Memorial Museum in Washington, CT. The relationship between Mr. Gunn and his pupil is not like most teacher-student relationships. It is much more like that of a relationship between a father and a son. Mr. Gunn, and Charley obviously cared much for each other, and their lives. After living with the Gunns for nearly six years, Charley really was a member of the family. Without Gunn, Charley would never have attained what he did [see biography]. From Mr. Gunn, Charley learned much more than merely algebra and geography, he learned about the abolitionist cause, how to learn and be curious, and how to be a proper gentleman. Charley Goodyear, I think, owes much of his success to Mr. Gunn, and he shows his gratitude through his letters, and kind words after Mr. Gunn’s death in 1881.